Right out my front door! The sheep often come by, bells jingling, dogs herding, and the shepherd, a strong, silent presence who merely needs to move his shoulders, or body, a certain way and all the sheep move where the silent message sends them. Sometimes it’s a whistle, or a precise grunt on his part, and the sheep come to a standstill. Magical. Like the stuff of fables. But to see it still alive in our world today is to connect immediately to what the past must have been like, with flocks of sheep moving over the fields everywhere, and shepherds, their silent guardians, living on the land with them as a large integrated unit. 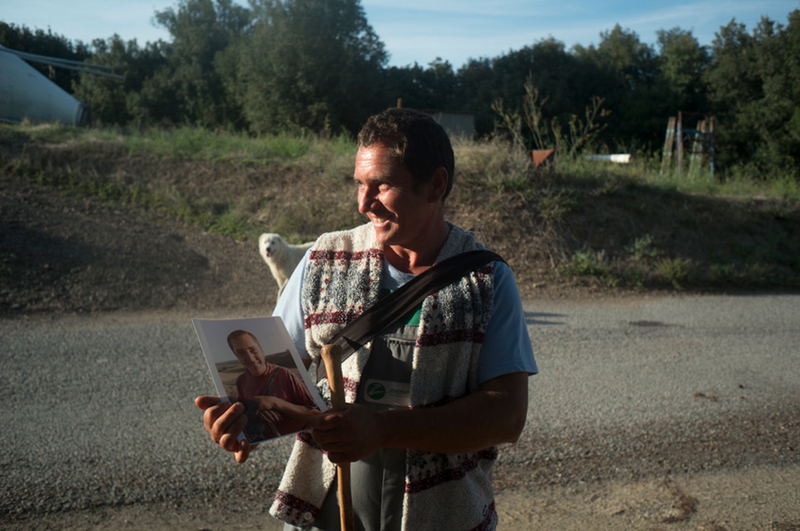 The year before, when I encountered him way out in the fields, I made a portrait of him, and when he passed by today I brought it out for him. He looked at it, and I believe he couldn’t quite believe it was him, so unused to a mirror is he. 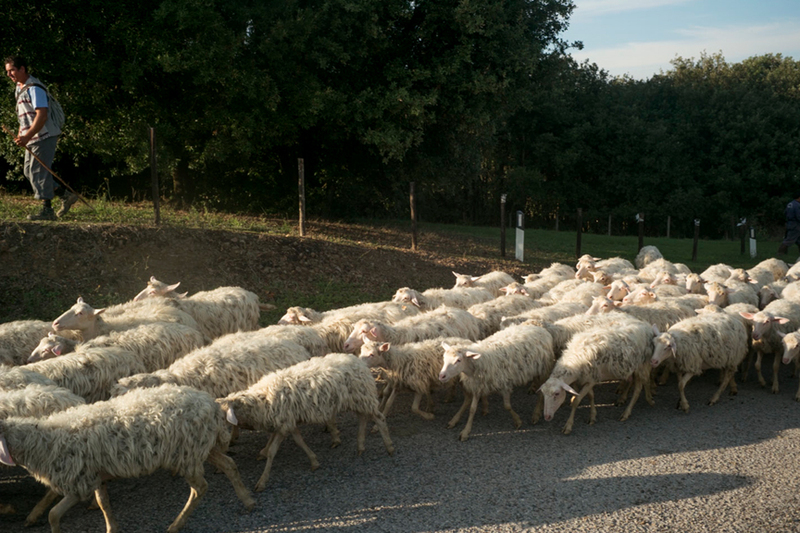 This entry was posted in Italy, On the Road, Sheep, Tuscany and tagged portrait, Sheep, Shepherd, Tuscany on October 3, 2015 by joelmeyerowitz2014. Not the past. Live in the present and hope for the future. Once out of the city, life turns greener. Listen to Stardust. Sing it softly to yourself and then to your wife. People smile with their eyes, not to show you they feel happy, but because they are. He sees, but not himself. Hard to know if we advance the human race with our portraiture, as it is a moment from the past. But we do make people accept themselves.